Our Family Promise: We believe every family deserves a quality funeral service and we promise to honor your loved one in a dignified way. Caldwell Parrish Funeral Home & Crematory is a family owned business serving central Iowa with locations in Urbandale, Adel, and Winterset. Brothers, Mark and John Parrish purchased their first funeral home in April of 2014 from James and Karolyn Raddatz, who had owned Caldwell Raddatz Funeral Home & Crematory since 1987. 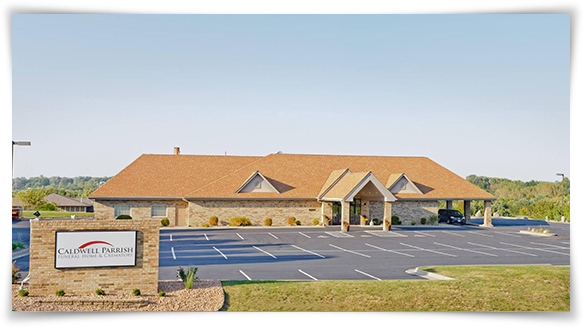 The history of the funeral home dates back to 1929, when Esther and Roy Caldwell started serving families in the Des Moines area with personalized care and attention to detail. These are the standards Mark and John hold themselves to today with each family they serve, and a practice that is customary at their other two funeral homes as well. In October of 2017, Mark and John purchased McCalley and McCalley-Collins Funeral Homes. McCalley Funeral Home was built, owned, and operated by Stephen McCalley for nearly 25 years. Steve purchased Collins Oak Park Chapel from J. Thomas Collins in 2008, and the funeral home became McCalley-Collins Funeral Home. The brothers decided to combine and incorporate the funeral homes with Caldwell Parrish. The staff at Caldwell Parrish are committed to providing support, compassion, information, and direction as needed to serve all members of our communities, their families, and friends who are dealing with loss and grief.